We recently worked with the folks at Built with Chocolate Milk, Competitor Group and Ironman Champion Mirinda “Rinny” Carfrae in Boulder. Here are the promotional videos talking about her road to Kona and recovery with chocolate milk. We produced a promotional video for the new Variant saddle from Serfas. We spent a day at the FASTER Wind Tunnel in Scottsdale Arizona filming the details in their fit studio. Serfas used the video during the Interbike tradeshow – in the booth on large TV monitors. Subscribe to their YouTube channel to see the rest of these videos and more as they are rolled out. 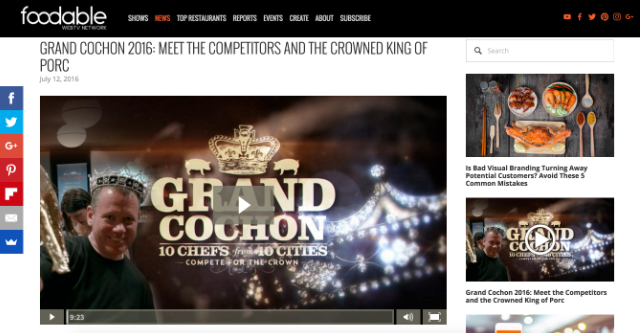 We recently produced a video for FoodableTV about the Grand Cochon 555 culinary competition held at the Viceroy hotel in Snowmass Village, CO. The 2016 Grand Cochon 555 Tour featured 10 chefs from 10 cities preparing heritage breed pigs using everything from snout to tail. We completed our 10th Amgen Tour of California, primarily recording raw video for licensing purposes. We were able to produce a standalone piece that we found interesting – Rally Cycling and their custom painted bikes benefitting the UnitedHealthcare Children’s Foundation. Rally Cycling rider Evan Huffman even won the King of the Mountains jersey making it a successful event for the team. We have been working with ad tech startup Sovrn Holdings, Inc. recently. They have a robust video library available to their customers. The video above, which we produced, demonstrates simple whiteboard explanations as part of their #ASKSOVRN series. We worked with Competitor Running to produce a video during the launch of the Hoka One One Clayton at The Boulder Running Company. The event was intended for media and included a fun run in the Clayton’s, food and a talk by Chris Hillyer and Jean-Luc Diard of Hoka One One. This was our third time working with the UnitedHealthcare Pro Cycling team, support staff and marketing folks. This year the camp took place outside of Tampa, Florida, which produced a unique set of challenges. After 5-days of various shooting we came away with enough content to make a behind the scenes video showcasing the men’s & women’s teams. We had the pleasure of sprucing up an interview with Usain Bolt talking about his future. This came in as a last minute editing request from Competitor and we were able to respond and turn around the final approved edit within a day. The folks at Competitor Running have always done a great job with their video series and individual projects over the years. We have been part of many of those projects including a small part in their latest series Chasing Rio, where they follow the story of Meb Keflezighi on his quest to make the Olympic Track & Field team for a fourth time at age 40. Our part of the production in the video above was the interview with Alan Culpepper. In addition, our video interview below was released on the Competitor website in the lead up to the Olympic Marathon Trials in Los Angeles on February 13th.